Despite its name, heartburn doesn't affect the heart. That burning feeling in your throat is the acid from your stomach traveling up the esophagus. Find some heartburn relief with these titles from our digital collections! Are you tired of suffering from painful heartburn, acid reflux, indigestion, embarrassing belching, or the frightening feeling of food getting stuck in your throat? If you're one of the 60 million Americans suffering from heartburn or one of the 20 percent affected by GERD, you may be looking for solutions to ease your symptoms and heal your digestive tract. Or you may be one of an estimated 20 million people who suffer from GERD but doesn't know it. 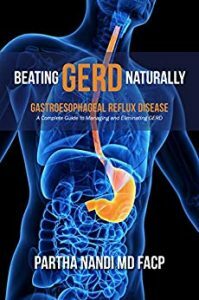 In Beating GERD Naturally, the host of the Emmy award-winning TV show, The Dr. Nandi Show, which reaches over 90 million US households, offers a complete guide to heartburn, acid reflux, and GERD. A board-certified gastroenterologist, Dr. Partha Nandi has treated thousands of people with this condition and shares his insights on the root causes, treatments, and lifestyle changes that can dramatically reduce symptoms and reverse damage. In his signature passionate, empathetic style, Dr. Nandi introduces you to people who have eliminated heartburn and healed their digestive tract using the simple strategies outlined in this book. Do you suffer from abdominal bloating; a chronic, nagging cough or sore throat; post-nasal drip; a feeling of a lump in the back of your throat; allergies; or a shortness of breath? If so, odds are that you are experiencing acid reflux without recognizing the silent symptoms. Even without the presence of heartburn or indigestion, more than 60 million people are suffering from acid-related disorders that are undetected or untreated—and leading to long-term health problems, including the rapid rise of esophageal cancer. Since there are no outward signs of acid damage and the typical symptoms might not be recognized, until now you might not have known how pervasive acid reflux is or that you have it. Learn to use herbs to treat a variety of digestive ailments and liver diseases. Noted herbal clinician David Hoffman explains the causes and symptoms of 14 common digestive concerns - including constipation, diarrhea, gas, heartburn, peptic ulcers, and gallstones - then offers simple herbal treatments and lifestyle changes. 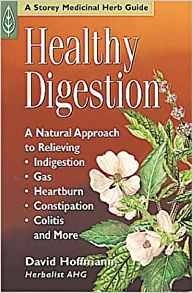 A comprehensive A-to-Z directory of the 37 herbs that most effective promote a healthy digestive system includes thorough preparation instructions and dosage information for gastrointestinal wellness. 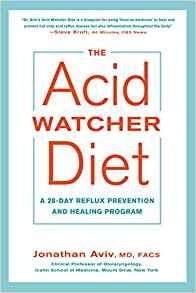 Learn the healthy way to prevent acid reflux and GERD. Acid reflux and GERD are painful and frustrating medical issues that can lead to serious health complications. With Prevent Acid Reflux you will be able to fight acid reflux and GERD by making smart changes to your diet. 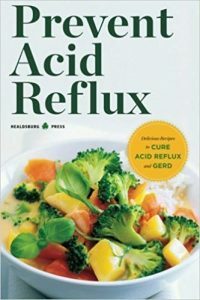 Prevent Acid Reflux is your step-by-step guide to reducing acid in your diet so that you can stop GERD and acid reflux in their tracks. Whether you occasionally suffer from acid reflux, or have been struggling for many years, Prevent Acid Reflux will help you make simple lifestyle changes that will permanently improve your quality of life. Prevent Acid Reflux will make it easy to get rid of acid reflux, GERD and heartburn, with: Over 75 easy, delicious recipes to prevent and cure acid reflux and GERD14-day meal plan to quickly eliminate acid reflux and GERDTasty recipes that will relieve both mild and severe symptoms of acid reflux and GERDQ&A to determine whether the acid reflux diet right for youFind out how a healthy diet can eliminate the pain of GERD and acid reflux forever. Prevent Acid Reflux will allow you to enjoy food once again, without the fear of acid reflux or GERD.